Metro Radio Arena (formerly the Newcastle Arena and Telewest Arena) is a sports and entertainment arena in the city of Newcastle upon Tyne, North East England, United Kingdom. Owned and operated by the SMG Europe and sponsored by Metro Radio, it hosts music, entertainment, sports & business events. Having also had various professional basketball and ice hockey teams as tenants for much of its history, since 2009 it has had no ice hockey team after the departure of the Newcastle Vipers to the Whitley Bay Ice Rink, and no basketball team since the departure of the Newcastle Eagles to Northumbria University's Sport Central arena in 2010. Two well known local musicians conceived and helped build the arena, Chas Chandler and his business partner Nigel Stanger. The NYSE listed Ogden Corporation was awarded a 20 year contract in February 1995 to design the arena, and once completed, to manage the facility including booking and promotion. According to Ogden, the arena clearly filled a market opportunity for touring acts who had otherwise bypassed the area, with the next nearest local venue being the 2,000 seat Newcastle City Hall, and the only other medium sized venues being as far away as Sheffield to the south or Glasgow to the north. Acts that did visit the region often had to make use of the 3,200 seat Whitley Bay Ice Rink. The arena cost 10m pounds to build, and opened as the Newcastle Arena on Saturday 18 November 1995 with a basketball league game between the resident team the Newcastle Comets, hosting the Doncaster Panthers. The Ogden Corporation assumed full ownership of the arena after Chandler and Stanger sold their stakes. Chandler died in 1996 while Stanger died in 1999. In 1997 the arena was renamed the Telewest Arena after a sponsorship deal with the telecommunications and cable-television company Telewest. In 2000 the Ogden Corporation sold the arena to SMG for $240m. 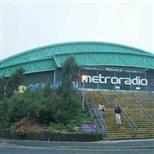 In January 2004 the arena was renamed as the Metro Radio Arena after a new sponsorship deal was signed with the independent local station Metro Radio. The seven figure deal was to last a minimum of three years. By 2005, the end of the first decade of operation, seven million people had attended events at the arena. The arena is a 5 minute walk away from the metro and train station Newcastle Central. The Metro Radio Arena Newcastle is only 3 minutes from the A1 North - South route. Take the A184 signposted 'City Centre', then follow the A189 over the Redheugh Bridge. When in the vicinity of the Arena, follow the signs to the appropriate car parks. Taxis can pick up on Railway Street/Arena Way before and after events. There is also a taxi rank at Central Station. There are two bus routes that go to Railway Street next to the arena: No 22 Goes from Market Street to the Arena, the last one is 6.25pm. No 604 Goes from Eldon Square, the last one is 11.00pm. There are over 600 convenient Official Car Park spaces available on site at the rear of the building. Alternatively, when the Car Park is full, the venue recommend using the NCP Car Park located next to the Arena, with its entrance on Redheugh Bridge Road. There are many wheelchair spaces in the arena. They need to be booked through the venue. The arena has a loop system. Please contact them for more details. Please contact the venue for further information as it depends on the type of event. To better accommodate your needs, Metro Radio Arena has requested that all accessible seating ticket accommodations be solicited only through their representatives. Please contact a Metro Radio Arena representative for further help with your ticket purchase. The number is 0191 260 6066 or email accessibility@smgnewcastle.co.uk.